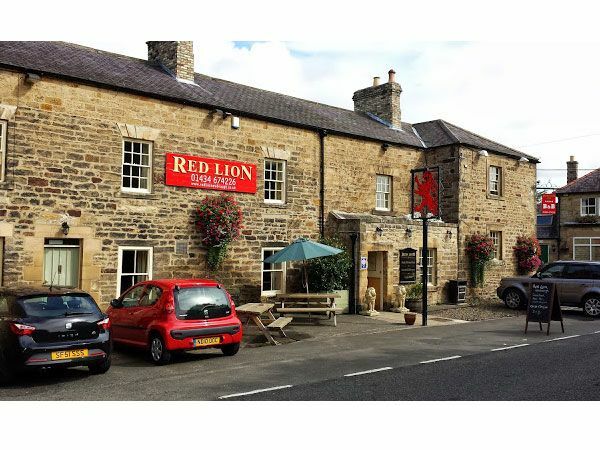 Andy, Sue and Staff welcome you to the Red Lion at Newbrough, an old coaching inn dating back to the 1190's that has been brought back to the 21st century whilst maintaining all the charm of a countryside bed and breakfast with its log and coal burners and comfortable chairs. Relax and enjoy local real ale, fine wines or other beverages available from the well-stocked bar. We have two restaurants; the Stable and Beattie's, both have log fires and a homely atmosphere. We offer a selection of freshly made food with a twist; the Red Lion prides itself on providing very high quality delicious food. The menu is season and the produce is locally sourced, our cod and mackerel are caught off the Seahouses and Beadnell coast only an hours drive away and well worth a visit. 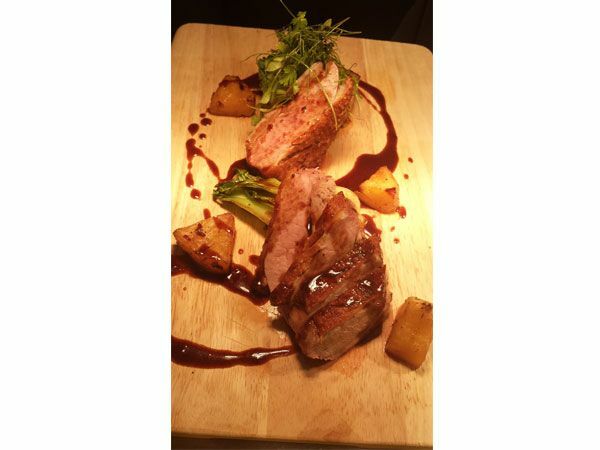 Andy has been a professional chef for more than twenty years in many fine establishments gaining 2 rosette accolades, you can be sure of the highest quality food and service here. 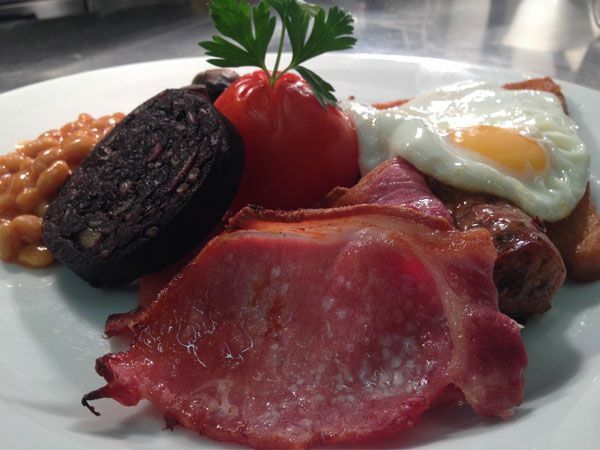 Breakfast is served in the Stable restaurant from 8:30 until 9:30 am, lunch from 12-2 pm evening meals from 6-9 pm Tuesday to Saturday (during winter months till 8 pm Tuesday to Thursday). We have five letting ensuite rooms all upstairs, room 1 can be a twin/double, room 2 is a double, room 3 can be a single/twin or double as with room 5 and room 4 is our family room, 2 adults and 2 children or 3 adult occupancy. We have a boot and laundry room with washer/drier and ironing facilities available,and secure outside storage for bikes. 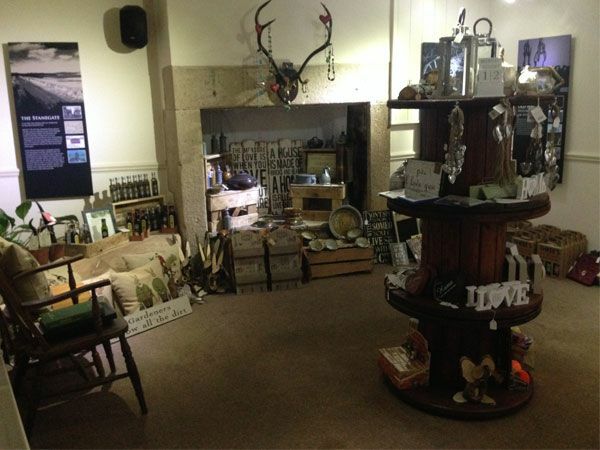 Our new Stanegate room which is situated in part of the pub has recently opened to celebrate all things local, it represents local history along with lots of craft and artwork by local residents and showcases for new and developing local talent. 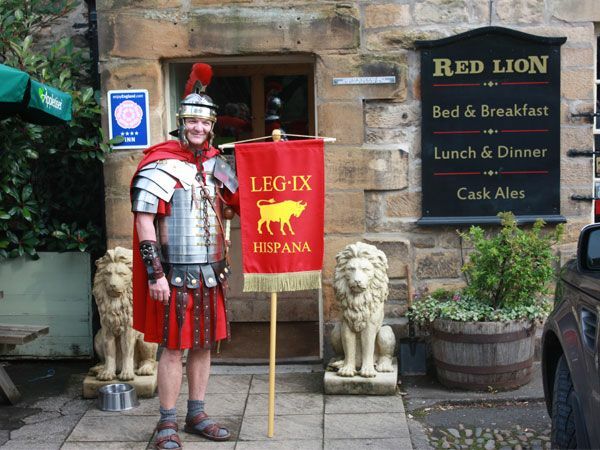 The Red Lion enjoys a scenic location in the picturesque village of Newbrough four miles from Hadrian's Wall. The historic town of Hexham is close by with its lovely Abbey. If you fancy a spot of shopping, Newcaslte, Gateshead and Carlisle are only a 30 minute drive away. Northumberland is a wonderful county with many unspoilt areas of outstanding natural beauty. Bamburgh castle, The Farne Islands and Lindisfarne (Holy Island) are all beautiful and worth a visit Cragside, Wallington Hall, Dunstanburgh Castle and Alnwick Castle and Gardens are a must as well! Single occupancy available in some rooms - £50 per night. 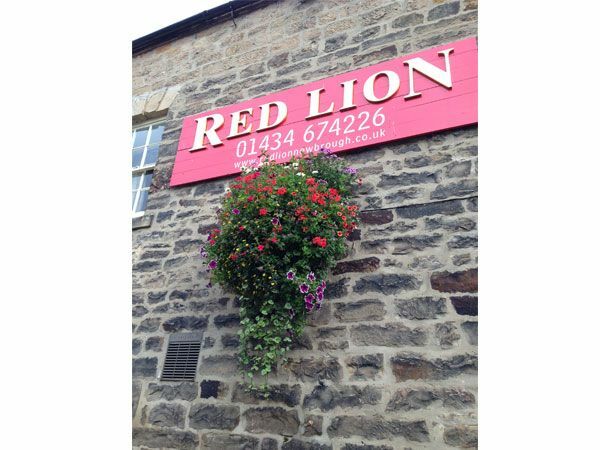 We stayed four nights at the Red Lion while exploring the Wall's greatest hits. The place was clean, the beer was fine, and the service was excellent and delivered with a smile. The evening meals are a little pricey but of good quality, but you might bear in mind that there is nowhere else to eat or drink for miles around. The showers are hot and strong, the wifi is excellent, and the breakfasts tasty and filling. All the boxes were ticked! A really cosy local pub, worth the diversion from the main Hadrian's path. Great room. Good selection of beers and wine in the bar. Evening meal and breakfast both beautiful. Very friendly staff and locals...a great place to stop for the night! Excellent (if pricey) lunchtime food! We had a very pleasant walk in the neighbouring snowdrop wood and finished with a lunchtime 'snack' at the Red Lion, an 'olde worlde' pub with authentic table and bench fittings in the bar. We were hoping to have a quick bite to eat, but the menu featured mainly large meals at non-lunchtime prices. Nevertheless, we opted for four x beef sandwich and chips and we were pleasantly surprised by the quantity and quality of the beef. We were also offered a welcome gravy boat. The service was efficient and we enjoyed our short stay at this clean and agreeable pub. 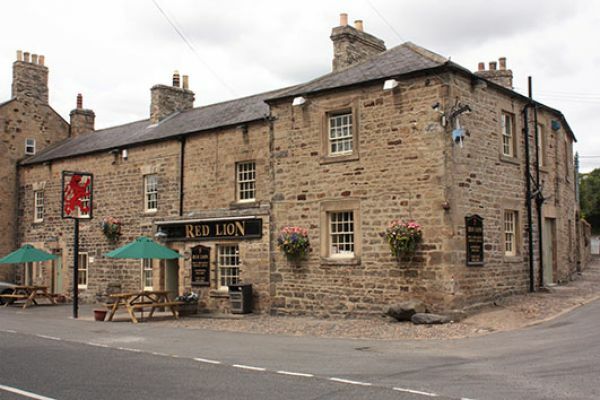 We stayed at the Red Lion for a birthday weekend away from Jan 25th. Warm welcome on arrival and shown up to our room, which was room 6. A very clean and spacious room attached to the side of the pub with a feature stone wall and fireplace and dual aspect windows. Very comfy large bed and luxury bedding, towels and robes. 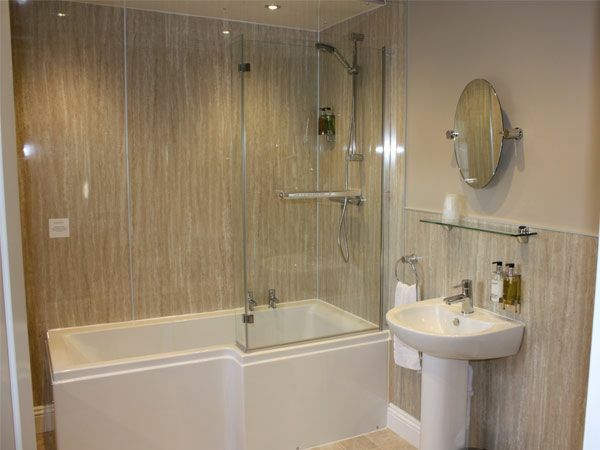 Very clean en-suite with shower. Breakfast on both mornings was wonderful, full English, well cooked and presented with plenty of flavour, excellent sausage and bacon, with all the extra bits on hand such as cereals, yoghurts, fruit etc. Had an evening meal on Saturday night, potato skins starters which were lovely then I had a fantastic chicken breast stuffed with haggis and wrapped in bacon whilst my wife had a steak & ale pie, plenty of fresh veg and good large portions. Served quickly too. 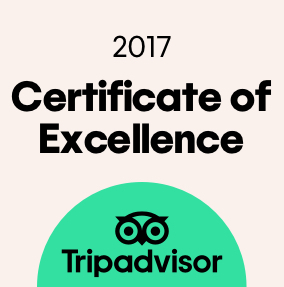 All of the staff were very friendly and welcoming at all times. We can highly praise the Red Lion, well worth every penny. Thank You Andy and Sue, we will return.